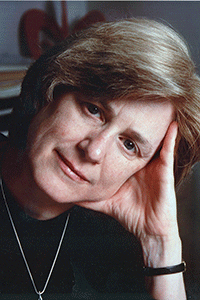 Mary-Claire King was the first to prove that breast cancer is inherited in some families as the result of mutations in the gene that she named BRCA1. In addition to inherited breast and ovarian cancer, her research interests include the genetic basis of schizophrenia and human genetic diversity and evolution. She also pioneered the use of DNA sequencing for human rights investigations, developing the approach of sequencing mitochondrial DNA preserved in human remains, then applying this method to the identification of kidnapped children in Argentina and subsequently to cases of human rights violations on six continents. Dr. King received her Ph.D. in genetics from the University of California at Berkeley, where her dissertation in 1973 demonstrated that humans and chimpanzees are 99% genetically identical. Dr. King has served on the Advisory Committee to the Director of the National Institutes of Health and the National Commission on Breast Cancer of the President’s Cancer Panel.